So says Simon Williams, director of the Ballery art Gallery. “Art belongs to the people, it is not exclusive. 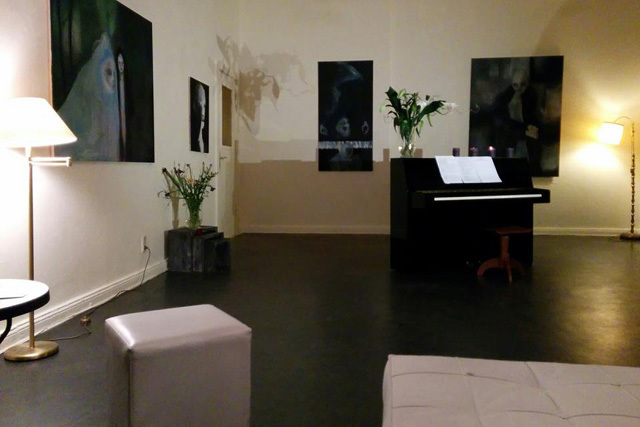 The successful artists are those who have something to say.” The Ballery is located at Nollendorfstraße11-12, Schöneberg, 10777 Berlin. The Ballery occupies what used to be the exclusive reception room of the Piscator-Bühne, theater of the renowned German theater director and producer, Erwin Piscator, which was around the corner. It had been joined to the theater, but the connection has since been closed. The room has a reverent quality, with arches along the far wall and church-like acoustics. Down the street is the house of the late author Christopher Isherwood, and the woman on whom his character of Sally Bowles is based is said to have lived nearby. The area around Nollendorfstraße is packed with restaurants, shops, and simply oozes culture. Marlene Dietrich sang at clubs in the area and it is known for its open minded refinement. 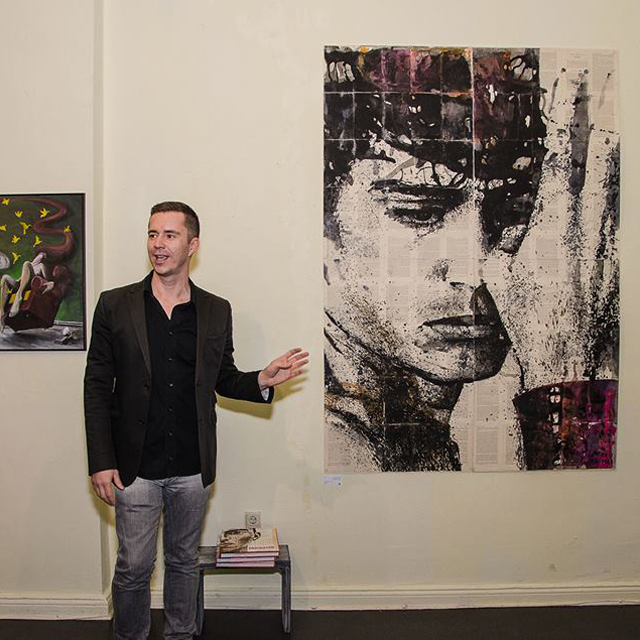 I attended the ‘Fading Spirits’ art opening at the Ballery a little over a week ago. As I entered the gallery, I was approached by the curator of the show, Nina Braunsteiner. She was welcoming and elegant, and instantly made me feel comfortable even though I didn’t know a soul. The large room was lit by a combination of a dreamily modern chandelier and industrial lighting that resulted in the perfect glow that encourages strangers to talk to one another while admiring the fascinating art pieces. A pianist , Natalia Tsypa, was playing an eclectic mix of music that ranged between many genres; her fingers delicately sprinkling the room with music, enhancing the glow with its splendor. I made my way through one half of the show, which consisted of photography by the Bulgarian photographer Stanka Koleva, sipping my wine that I had purchased for 3 euros and admiring the presentation of the haunting photographs. 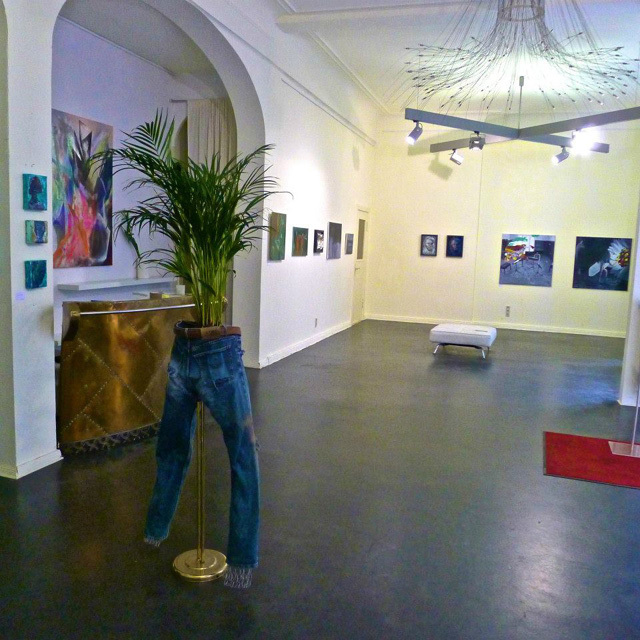 The other half of the show consisted of paintings by the French artist Rebecca Brodski. The paintings were large and dark, inspiring thought. I headed to the bar for a second glass of scrumptious and inexpensive wine. The bartender was doing an incredible job, similar to a character in a movie in fact, of pouring drinks, providing entertaining conversation and handing out compliments in various languages; it was delightful. We struck up a pleasant exchange as a happy incandescence settled in the room. As I was basking in the fact that I was surrounded by inspiring art, listening to beautiful music, drinking wine and enjoying pleasantries, Simon Williams approached and introduced himself. His cultivated English accent and suit charmed me. He is the director of the Ballery and certainly is the genesis for its sophisticated warmth. What is your focus for the Ballery? I want the Ballery to be a culture center: a place for breeding and sharing ideas. A part of the Berlin art community, or as I like to call it, the Common Unity. In an art gallery a person has the opportunity to connect to themselves through someone else’s artwork. What do you consider a successful show? Success is relative: when the art is fabulous, when the guests are great, when we have a sale, when there is a feeling of harmony, when there is a sophisticated mixture in the crowd. How do you find your artists? These days it is mostly through the artist network and recommendations. I do have many repeat artists as well. I also listen to what the collectors like. However, some artists also approach me. I believe that the world changes through creativity and kindness. This is what I want at the Ballery; for it to be an inspiring world. I want people to see something nice, hear something nice, meet someone nice, and feel a little different when they leave. I believe that the definition of art is the channeling of a person’s reality; it results in emotions that cultivate the mind. How often are the openings? Openings happen on Fridays, every other week. The next opening is the 6rd of March. Are there any other events? Yes, every last Thursday of the month we host Ghetto-Fabulous. This is a club to which we invite performers who share their talents with each other. We also have a ‘Speak Easy’ every Tuesday. The Ballery has space for everything. It is an art venue, concert venue, place for social gatherings, and more. When did the Ballery open? The Ballery opened in September. 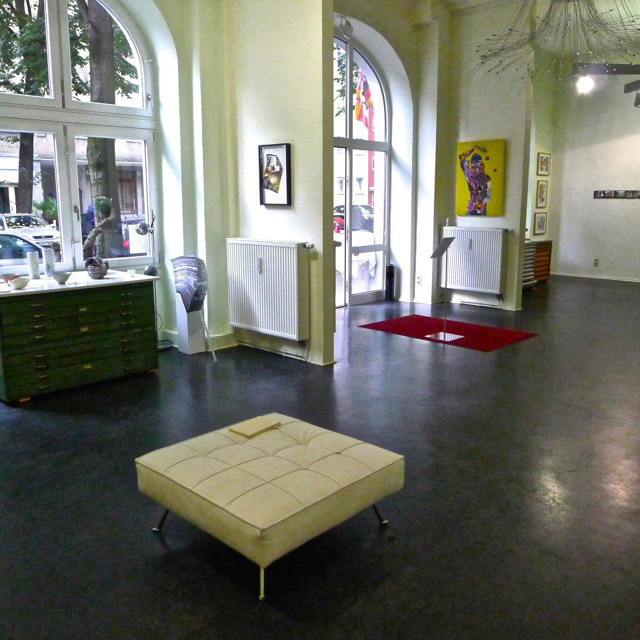 Before that I was the director of the Pop-Up Gallery Berlin. It was a smaller venue. I had it for a year. With its success I found I needed more space so I moved and opened the Ballery. Who helps you with the Ballery? I have guest curators. I let them design their shows and find the artists for their specific shows. How do you market the Ballery? I rely on word of mouth. We have a Facebook page, but as with the Pop-Up Gallery, the art speaks for itself. Artists are the leaders of a revolution and this attracts passion. I believe in building a good reputation and investing in the guests. What should a curator wear? A curator should stay neutral, to respect the art. What are your hopes for the Ballery? I want it to be fabulous. The word ‘fable’ is the root to ‘fabulous’ and I want to provide a venue where artists can share what they love, where they can tell their stories, fabulously. Sasha is a classical singer and animal lover and has been in Berlin since 2014. She is from the US and the place she lived the longest is Austin, Texas. Berlin Logs is a print & online publication, based on the idea of citizen journalism. We are a growing team of writers from all over the world who all have one thing in common – a passion for this city we now call home. So, whether you live here, are thinking of moving here, or are just passing through, we're sure you'll find something to interest you. Copyright © Berlin Logs - Berlin for English Speakers - Imprint - Developed by Naxaf Webdesign Berlin.